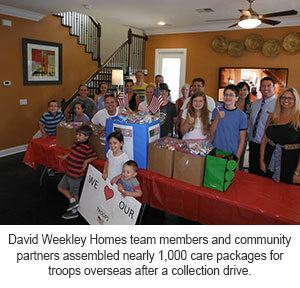 After collecting the hundreds of pounds of items, David Weekley Homes team members and helpers spent hours assembling the care packages with snacks, candy and toiletries for USO Central Florida. The USO seeks to lift the spirit of troops and their families by providing care packages to U.S. soldiers in even the most remote corners of the globe. Proud of their efforts in doubling their anticipated goal, the David Weekley Homes Family Foundation also donated a check for $10,000 to the USO of Central Florida.